View of the low back & pelvis from the back. The low back (lumbar spine) is comprised of 5 spinal bones (vertebrae). Each of these bones is given a number 1-5, from the top down. 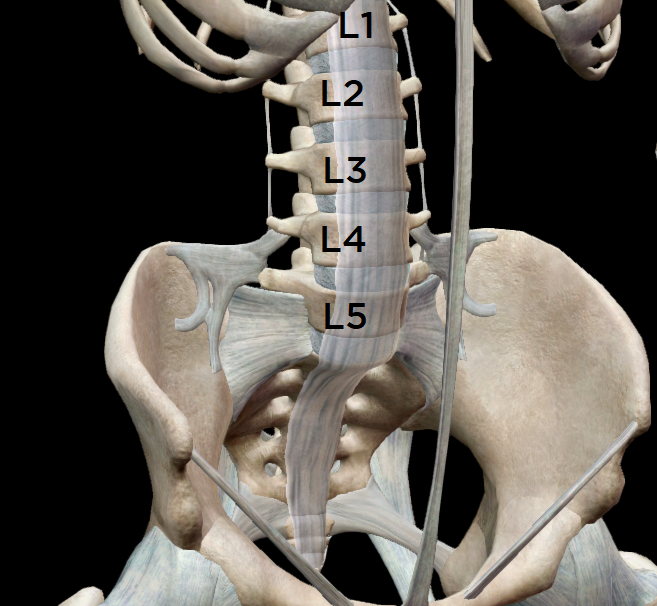 The L5 is connected to the sacrum, which is the triangular piece of bone joined between the two pieces of bone that make up the pelvis. View of the low back & pelvis from the front. From the front view, you can see discs in between the spinal bones. Also, you can observe a long thick ligament (anterior longitudinal ligament). Please note that because of the attention the disc receives, we will cover the disc more in depth at another time. View of the low back & pelvis with nerves from the back. The spinal canal is a long column of space which allows the spinal cord to pass through from the bottom of the skull all the way down to the tail bone. As each segment between the spinal bones, the cord branches out into nerve roots. Sometimes few nerve roots combine to give rise to a bigger bundle of nerve. In the lower back, an example of this is the sciatic nerve which is well-known (often as a pain causing structure). View of the low back & pelvic muscles from the front. Surrounding the low back bones, discs, ligaments, nerves etc. there exist muscles which provide support and movement. View of the low back & pelvic muscles from the back. As you may see, the network of muscle around the spine consists of small muscles which join from one spine to another, as well as larger and longer muscles which join multiple levels of spinal bones. It is also important to note that some low back muscles directly attach to the pelvis and the femur (thigh bone). We have tried to keep this post as simple as possible and without using too much medical jargon. As you read other posts to see how you can resolve pain, prevent injury and live your life, we hope this basic understanding of anatomy will help your journey.